2012 Fall West MadWags Memorial Members Tournament Champs TackleThis! Mikes Rx Baits and KustomKicker! Thankfully, a few members have already shared some of their stories but finally, under the better late than never category (hopefully), here are the official results and some pictures too! 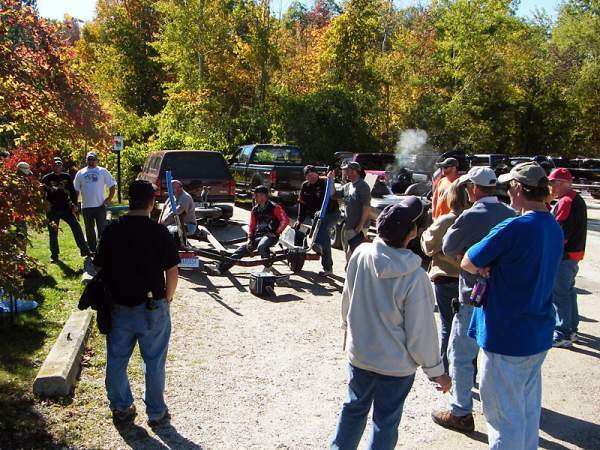 Here are the complete results of another fun event on a beautiful fall fishing day in Northern Michigan!! It was tough again on Skegemog Lake but the fishing was a little better than last fall. The husband and wife team of TackleThis! and Deb took home a whopping $52 for first place along with two big prize packs filled with great sponsor-donated tackle and gear including 25% off courtesy of Grandt Rods! 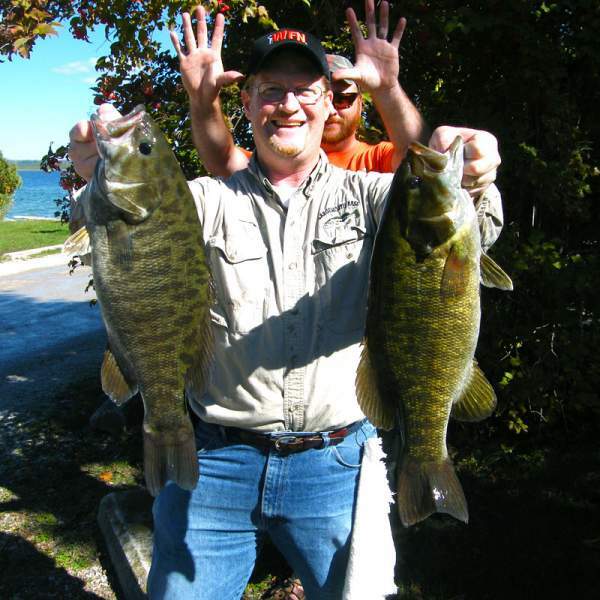 They had the only 5 bass limit with smallmouth bass weighing 11.44 pounds. TheFishinPollock and Ma almost made good on his promise from last year to win with a 2nd place finish, missing by only .19 pounds with 4 keeper bass weighing 11.25 pounds. He and Ma bagged a big $28 and two more prize packs! Yours truly, me - djkimmel, fished alone to come in early and due to the arrangement of anglers who made it along with some boat swapping. I went sightfishing and spooked a bunch of Skegemog Lake bass off beds (yes, I said beds...). There were some small groups of bass hanging out shallow in the same areas but I'm apparently more than a little rusty. I still managed to pop two toads off of one circle under a big log that weighed 10.12 pounds with the bigger bass going 5.15 AND still did not get big bass!?! So I'm saying the fishing was better this year. I was fortunate to get 3rd place and $20. I gave my prize packs away to members first out of the prizes. Big bass when to last year's champ LGMOUTH. Though he and Genie only managed 2 keepers like myself, they were good for 4th place with 9.10 pounds thanks to a real fat toad smallie weighing 5.30 pounds!! 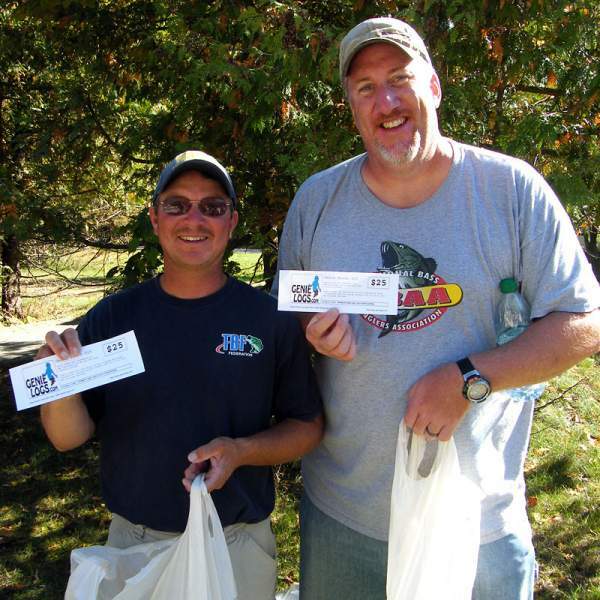 LGMOUTH took the big bass pool of $40 and an additional prize pack for his toad bass! Mr. Consistency - Cy - caught 3 keepers again for almost the same weight he had last year! This year, he teamed up with Ypsibass and they brought in 7.41 pounds. They got two more prize packs. No ducks this year for the Big Ugly! Firefighter Jeff, fishing with thedude this year, brought in some huge perch including the 2012 Big Ugly winner 1.16 pounder to get another Big Prize Pack including a WaveSpin Reel! Other perch and a 3/4 pound rock bass took a run at the coveted Big Ugly title! Prize packs were given out to the top 6 teams, big bass and the Big Ugly award including 2 Wavespin reels, Grandt Rods discounts for the winners, a bunch of big KustomKicker lure packs, K&E Stopper lure packs, a bunch of lures from The Mangler, Case Plastics, Xtreme Bass Tackle and Joshimoto son at Angling AI! In addition, Mike Broge from Mikes Rx Baits drove up to fish with us bringing enough Mikes Rx tubes for everyone to get a pack, and Genie gave everyone who participated a free 1-year membership to Genie Logs! An added BONUS this year was having Wonderland Marine West sanction the MadWags Memorial Members Tournament. What this means is that if either member of the winning team bought their boat from Wonderland and are still the registered owner, even if you're not fishing from that boat, you will receive a $200 Gift Certificate through their Customer Cash Program!! TackleThis! did not get his boat from WMW so no bonus, but this is still exciting since the Spring MadWags East will also be sanctioned! Odds are pretty good that the winner might get this additional bonus! An extra bonus came late via a motor vehicle accident. Sponsor-advertiser The Tackle Hut is doing better now but was dealing with lumps and bruises and replacing a vehicle during our event but got back with me about donating a nice prize pack after our event. I held a random drawing and new member MikeM. 's son Keith was the lucky winner!! This was Keith's first bass tournament and he's hooked! Great job everyone! Hopefully, these added benefits help you with your future buying decisions considering that I could not keep GreatLakesBass.com going without the generous help of the Sponsor Advertisers like these! See the updated MadWags Champions Online Virtual Plaque for the history of all the big winners and thank you to all of you who participated, helped out and donated prizes!! As nice as a husband and wife team winning! TheFishinPollack and his Ma taking 2nd place. Ma says she loves fishing with her son! One of the many nice things about the MadWags Memorial Members Tournaments! This picture proves 2 things. I can catch a couple big smallies still. And thedude can't count!! That's 2 bass dude! Not 10. But 5 would have been nice! 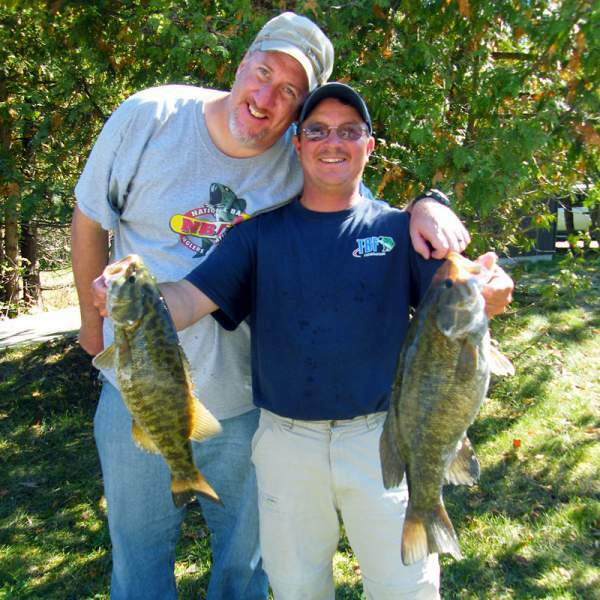 Two toad Skegemog smallmouth bass net me 3rd place with 10.12 pounds but no big bass prize! Adorable! That's all I have to say about this shot of 4th place finishers Genie and LGMOUTH that's even sweeter than a guy fishin' with his Ma! Well, I can add that LGMOUTH wouldn't let Genie hold his bass and he also caught a toad smallie! 5th place finishers Ypsibass and Cy. Cy looks like he wanted to catch more bass or doesn't like having his picture taken! Or both! Ypsibass was tired. I think. He rode up with Mojo! Talk about happy though!! Mike S. and Waterfoul squeaking into the prizes with 6th place. 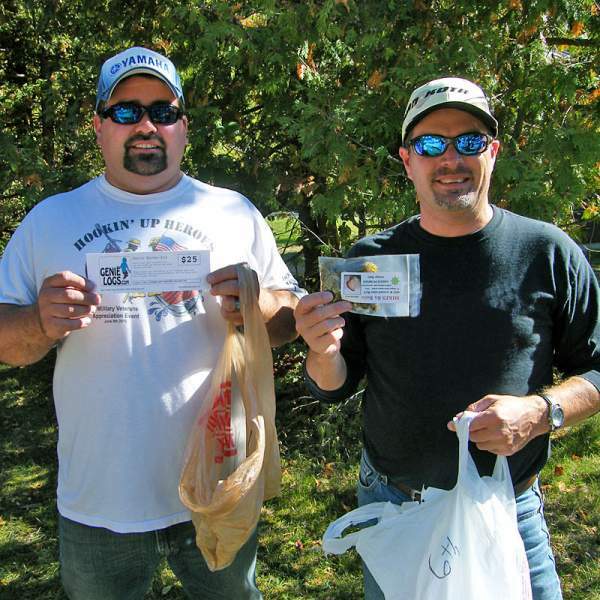 Their loot included free 1-year membership to GenieLogs and cool tubes from Mikes Rx Baits! thedude and Firefighter Jeff scored by finishing in 7th place, one spot out of the prizes. I donated my 3rd place prize packs (I have enough tackle for now) to the first spot out of the prizes. Look how happy thedude is! 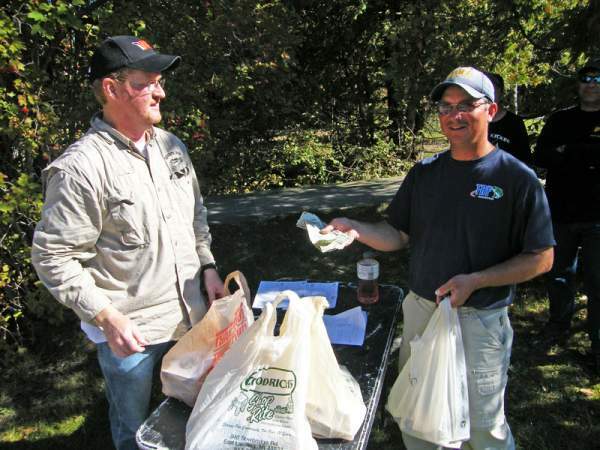 They catch 1 nice bass for 3.41 pounds (almost an exact repeat from last year for thedude) and get two bags full of prizes! Sorry 6th place!! Kind of an upset! 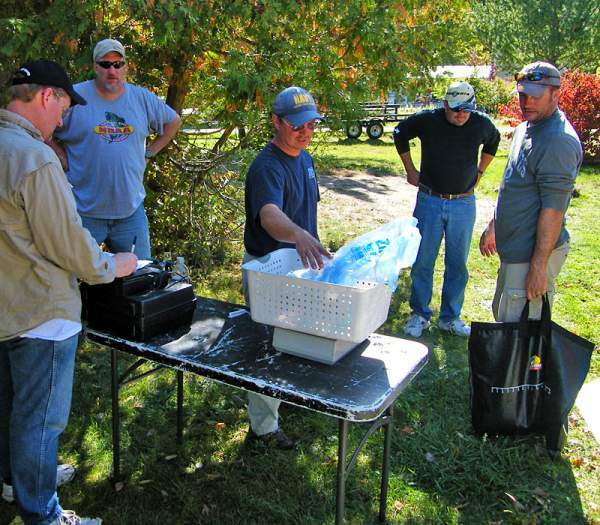 No Big Ugly this year for bassfan586, shown here far right waiting to weigh their 1 keeper bass. 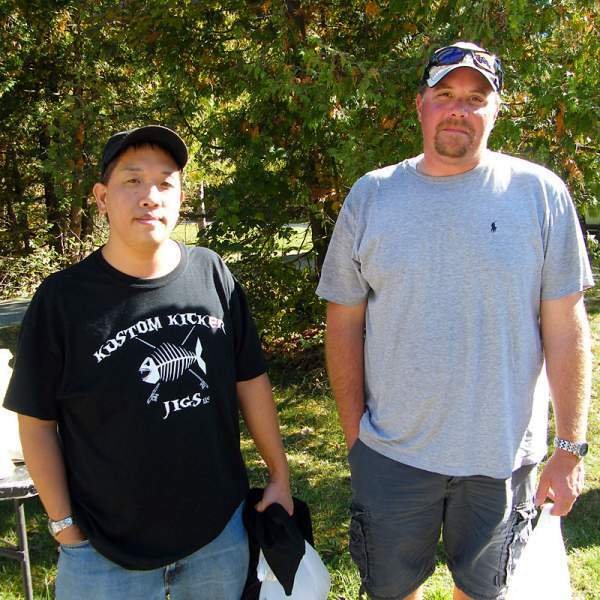 But he did cut the strings from his normal fishing partner deepdiver and brought along his Dad wesb (not shown) making this 2012 MadWags Memorial event a real diverse affair with a husband/wife team, son/mom team, son/father team, father/son team and Genie too! From left, me jotting the weights, Genie keeping us honest, weighmaster LGMOUTH running the scales and Waterfoul pulling his pants up ( ). bob o (far L) and Mojo (far R) ended up teamed together due to some last minute changes. They took the last bass spot at 9th place with 1 keeper for 1.81 pounds. They took a shot at Big Ugly too but their perch was not quite big enough. We even had a spectator to two at this event. The man in the middle just happened to be up fishing a club event and stayed to watch us weigh our bass. Most of the gang hangs out swapping fish stories while I try to do math after getting up too early. Far right is new member MikeM. in the red hat. He fished with his young son Keith who was in his first bass tournament of any kind. He wants to fish more. 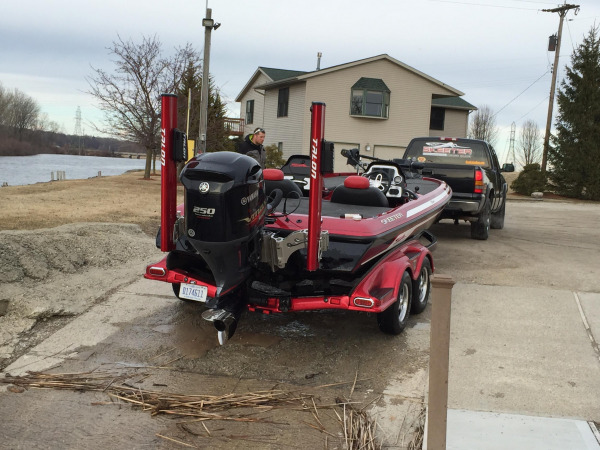 New member wesb fished with his son bassfan586. He's in the very center between Mojo (sitting on the trailer bunk) and bassfan586 (holding the trailer guide). Looks like bob o or someone on the left was telling the big fish story during this picture taken by unofficial official photographer for the day Firefighter Jeff! Looks like a bass tournament. And some fall colors at the Skegemog Lake public access site during the 2012 Fall West MadWags Memorial Members tournament with the boats lined up while we finish our weigh in. 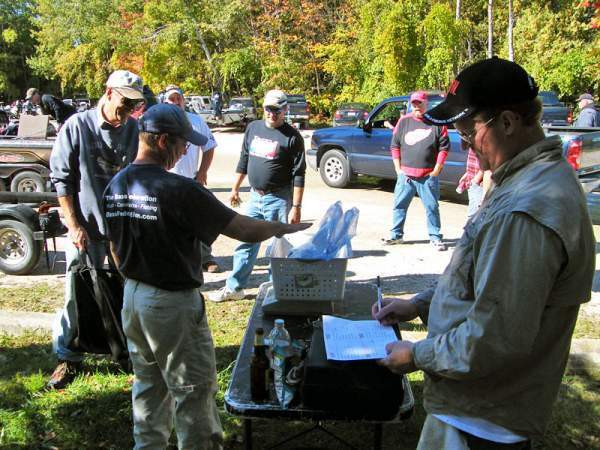 The bagline forms for the 2012 Fall West MadWags Memorial Members bass tournament. Cy digs out his bass while weighmaster LGMOUTH (his equipment - thanks Don!) weights. Cy's partner Ypsibass and eventual winner TackleThis! look on! Weighmaster LGMOUTH checks the scale for Cy and Ypsibass' bass while I prepare to record it. Eventual champion TackleThis! watches, ready to go next at Skegemog Lake. 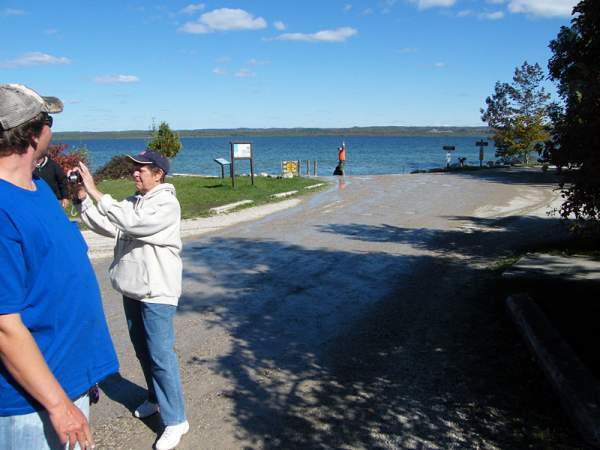 Ma, TheFishinPollack's fishing partner (and Ma), takes a picture at the 2012 Skegemog Lake MadWags Memorial event while thedude apparently wants someone to take a long shot at him and his bass at the Skegemog dock! I note the weight of LGMOUTH's super fat 5.30 pound Skegemog smallie while Cy, Genie, LGMOUTH and Waterfoul watch! LGMOUTH shows off the Big Bass winner, a 5.30 pound fatty smallmouth bass, caught while fishing with Genie during the 2012 Fall West MadWags Memorial Members bass tournament on Skegemog Lake! djkimmel counting out the 2nd place cash prize to TheFishinPollack and Ma! They each got a bag full of donated fishing gear along with the loot! I gave it all to Ma! LGMOUTH and Genie are all smiles with their 4th place prize packs including free 1-year memberships to GenieLogs! 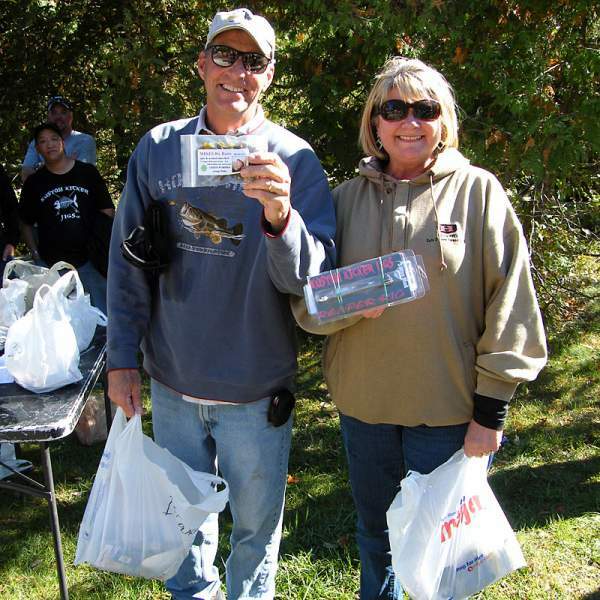 Genie was probably already all set but everyone who attended the 2012 Fall West MadWags Memorial Members Tournament got a free membership to the best online fishing log and angling management website on the Internet! LGMOUTH makes sure I see he got the Big Bass cash not me! Just kidding. 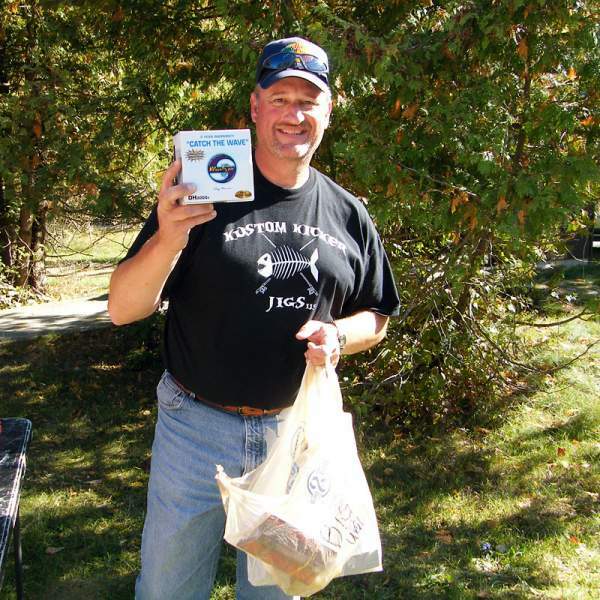 But he did get a wad of cash and a big prize pack for catching the toad 5.30 pound smallmouth bass during the 2012 Fall MadWags Memorial Members bass tournament out of Skegemog Lake September 30. Give a bag of fishing tackle to a bass angler and you can't get a picture of them! 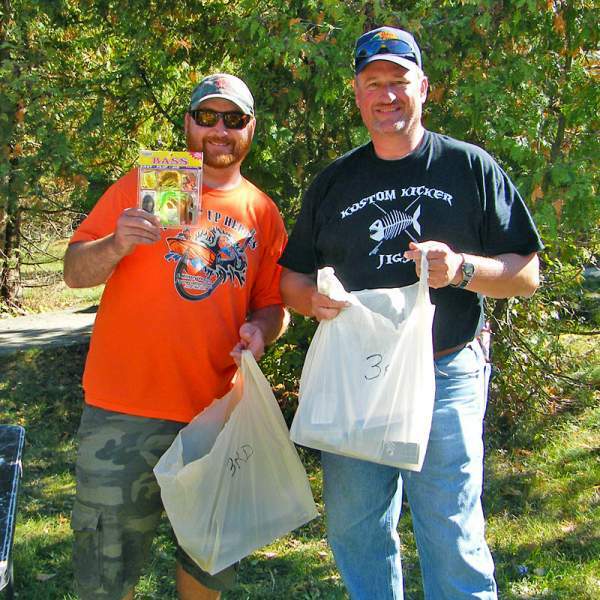 Mike S. and Waterfoul check out their prize pack for 6th place finish at the 2012 Fall West MadWags members' tournament. We added an extra place after Mike from Mike's Rx Baits came up with more generous donations along with all the other great stuff given! When you give Firefighter Jeff a camera and too much free time!?! 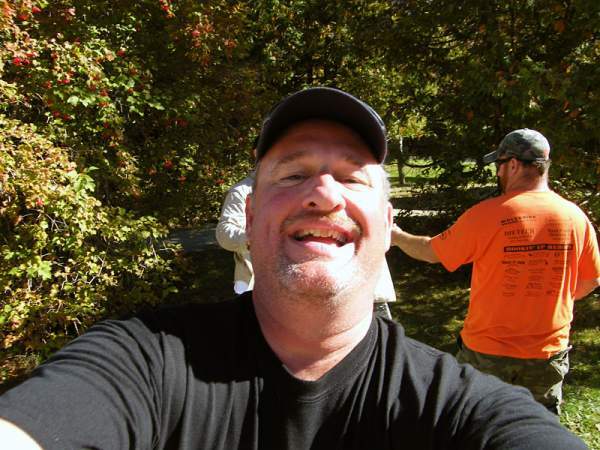 French fry 'volunteered' to be the official unofficial camera guy for the 2012 Fall West MadWags Memorial Members Tournament. Thanks FF! Apparently, he has a deep-seated desire to be a professional photographer. I'm preparing to weigh in their bass caught by his partner thedude. I know! I know! I should have put up a warning before that last picture!!! Speaking of Big Ugly! Guess who won the coveted 2012 Big Ugly prize at the Fall West MadWags Memorial Members Tournament? Yup, Firefighter Jeff! Firefighter Jeff goes perch fishing during the 2012 Fall West MadWags Memorial Members Tournament and takes the coveted Big Ugly Award - a huge prize pack including a WaveSpin Reel - with a big 1.16 pound Yellow Perch! FF caught a couple big perch that would make a fine meal with some french fries! There you have it. Pretty much the whole story. Well, not the whole story, but all you're gonna get unless you join us next year for the MadWags Memorial Members Tournaments!! Look at that handsome devil in the Yamaha hat. Name another website that gives this much back to it's members ? ? ? ? Ok. That Was was anemic. Let's try another - Name another website that welcomes new members like they were family ? ? ? Y'all sound like Yankee stadium minus the boos. Ok. Last one, name another website with folks as good lookn as us ? ?? ? I know where we should go next year!!!! Caught several over 3 pounds and a couple over 4 pounds there yesterday! And last week. And the week before. Firefighter Jeff did a GREAT job with the camera (overall - there were a couple weird things on the memory card?!?) but there was some type of technical issue with all of your pictures!?! Not sure what happened but I made the best of it. Sorry about that. If you have suggestions for next year's fall event, please PM me with them. I will be picking a date and putting up a poll shortly. The spring event is scheduled at this time for May 11, 2013 on Lake St. Clair. Sign up post soon. wha wha whaaaaa.... ha ha ... made ya look ! I vote Muskegon. Let's not be sissies. Give it a shot. There's a ton of fish there. Gotta get them east side boys to fish some water that isn't clear. Plus, I can sleep until 10 minutes before Dan says he will be there, and still beat him there. I thought I was early this year?!? Physically anyway? Or maybe I was late? I don't remember. I was riding with Genie. I think I made him stop somewhere for coffee. Heck, I didn't really pay attention to the time Dan. I was just picking. Muskegon is a little clearer, but it's no LSC by any means. I agree, there are several lakes here on the west side that have a more "exotic" flavor to them. Wherever lake gets decided on, I will be there with a smile on my face. You can count on that. I may even have a boat with me. Pick any lakeshore lake and I KNOW that every boat will catch more fish than ALL the fish weighed in the last two years. Combined. Especially THE lake. With all the smallies. Has some nice largies too... and BIG UGLY pike. And Drum. And Salmon. And Catfish. A veritable cornucopia of Pisces! It might be. It might not be. There are a lot of lakes.